How three football legends -- Bill Walsh, Joe Gibbs, and Bill Parcells -- won eight Super Bowls during the 1980s and changed football forever. Bill Walsh, Joe Gibbs and Bill Parcells dominated what may go down as the greatest decade in pro football history, leading their teams to a combined eight championships and developing some of the most gifted players of all time in the process. Walsh, Gibbs and Parcells developed such NFL stars as Joe Montana, Lawrence Taylor, Jerry Rice, Art Monk and Darrell Green. They resurrected the careers of players like John Riggins, Joe Theismann, Doug Williams, Everson Walls and Hacksaw Reynolds. They did so with a combination of guts and genius, built championship teams in their own likeness, and revolutionized pro football like few others. Their influence is still evident in today's game, with coaches who either worked directly for them or are part of their coaching trees now winning Super Bowls and using strategy the three men devised and perfected. In interviews with more than 150 players, coaches, family members and friends, GUTS AND GENIUS digs into the careers of three men who overcame their own insecurities and doubts to build Hall of Fame legacies that transformed their generation and continue to impact today's NFL. Born and raised in White Plains, New York, Bob Glauber has been Newsday's national football columnist since 1992. He was Newsday's football writer covering the Jets and Giants, as well as the NFL, from 1989-91. He was selected as the New York State sportswriter of the year in 2015 and 2011 by the National Sports Media Association and is the president of the Pro Football Writers of America. "Three dominant coaches, three dominant teams, one dominant writer. It's an irresistible combination. 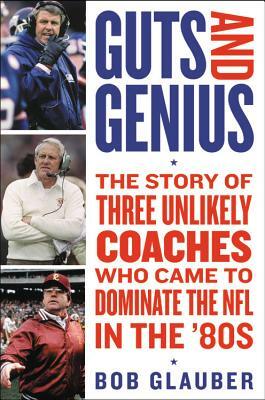 Long-time NFL writer Bob Glauber was right there as Bill Walsh, Bill Parcells, and Joe Gibbs created the best three-way rivalry in NFL history, and now he brings incredible insight and perspective to one of the most fascinating eras in NFL history. Walsh, Parcells, and Gibbs combined for three Hall of Fame busts and eight Super Bowl championships, and Glauber takes us behind the scenes to reveal how it all happened. "—Gary Myers, former NFL columnist Dallas Morning News, New York Daily News, and New York Times bestselling author of Brady vs. Manning and How 'Bout Them Cowboys?